CHATTANOOGA, TN - Clarity -- a division of Plantronics (NYSE: PLT) that creates smart communication solutions for seniors -- today launched Sempre™, a new amplified home phone that allows users to make calls through their existing wireless service. Sempre features Cellphone at Home™, a Bluetooth®-powered technology that allows users to enjoy the benefits of an amplified home phone without a landline service. Designed for people with hearing loss, Sempre amplifies incoming sounds up to 53 decibels. It makes soft sounds audible and keeps loud sounds in a comfortable range for the user through Digital Clarity Power™, a patented sound processing technology that functions similarly to a modern digital hearing aid. "Sempre provides the benefits of a Clarity home phone -- crystal clear sound, large caller ID, speakerphone -- without the need for a landline service," said Carsten Trads, president of Clarity. 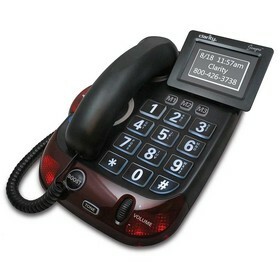 "It is the ideal home phone for people with hearing loss who cut the cord and only have a cellphone. And today's cellphones are simply not built to help the hard of hearing. We believe you shouldn't be limited to poor quality phone conversations just because you decided to stop your landline service. Sempre fills a void for millions of people with hearing loss across the US." Cellphone at Home™ quickly connects Sempre to users' existing cellphone service through Bluetooth® technology. Cellphone at Home™ allows users to easily make or receive phone calls on Sempre and ultimately have conversations that are louder, clearer and easier to understand. In addition to the 53 decibels of intelligent amplification, Sempre features an easy-to-use volume and tone control wheel that allows users to adjust settings to fit different degrees of hearing loss. It is hearing aid compatible, and the phone's extra loud and bright visual ringer along with its talking Caller ID ensure users -- even those with low vision -- always know when the phone is ringing and exactly who is calling. Just as importantly, Sempre's talking keypad help users dial the right person. Sempre is equipped with ClarityLogic™, an award-winning customer service technology that allows customer representatives to remotely access the phone and adjust and configurate the volume, tone control or other settings for the user. Users can expand the reach of Sempre with up to four extra handsets, if needed. Sempre can be purchased for $289.95 at www.clarityproducts.com.